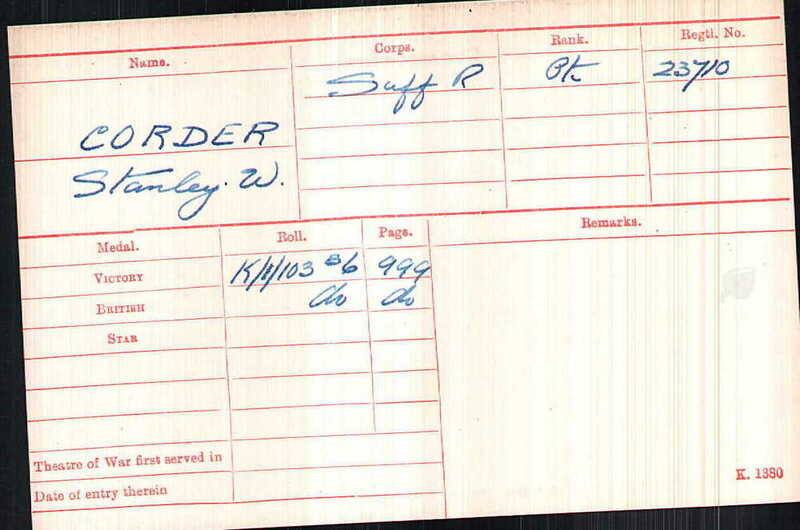 Private Stanley William Corder was entitled to the above medals. The whereabouts of Stanley's actual medals is currently unknown. In 1901 Stanley was living at home at 3 Bridge Street, Hadleigh with his father William (50) and mother Sarah Anne (48). By 1911, he was still at home with his mother, but his father had died by then. We do not know when Stanley joined the army, but we know that he served with the 8th Service Battalion the Suffolk Regiment. The 8th (Service) Battalion were formed at Bury St. Edmunds in September 1914 as part of K2 and came under command of 53d Brigade in 18th (Eastern) Division. They landed at Boulogne on 25 July 1915 although Stanley’s Medal Index Card suggests that he did not enter France until 1916. We know that his battalion was in the area of Carnoy preparing for the forthcoming planned offensive. The British artillery had started their preparatory bombardment of the German positions and the Suffolks were making their own preparations for the battle by creating assembly areas and sending out patrols to recce the German dispositions. The unit war diary states that on the 26 Jun 16, the enemy retaliated with artillery and shelling was particularly heavy in the area of No3 assembly area and 3 O.R.s (other ranks) were killed and 11 O.R.s were wounded. It is thought that Stanley was one of those killed. He is buried in Carnoy Military Cemetery, F.23. In March, the Hadleigh Great War Centenary Project took 30 children from Hadleigh High to the Somme and we visited Stanley's final resting place. We hope that this page has been able to tell the story of Stanley William Corder. If you know of any information which might help to add to the story then please get in touch.